ကညီကရၢမံၣ်နံၣ်စိထၣ်ဟ့ၣ်တၢ်ဆီၣ်ထွဲမၤစၢၤဆူ ပှၤဘၣ်ကီဘၣ်ခဲလၢအဃုတၢ်ဖံးတၢ်မၤတဖၣ်ဒီး ပှၤလၢ အမၤတ့ၢ်တၢ်လၢအပူၤကွံာ်သ့ၣ်တဖၣ်န့ၣ်လီၤ. ကညီကရၢမံၣ်နံၣ်စိထၣ်တၢ်ဃုဖံးဃုမၤအပှၤဟ့ၣ်ကူၣ်တၢ် (employment counselors) သ့ၣ်တဖၣ်ရဲၣ်ကျဲၤဃုန့ၢ်တၢ်ဖံးတၢ်မၤဒီး ဆှၢပှၤလၢကနုာ်လီၤ မၤတၢ် အဂီၢ်ဒီးဟ့ၣ်နီၤလီၤတၢ်သိၣ်လိဘၣ်ဃးတၢ်သ့လုၢ်အီၣ်သးသမူ ဆူပှၤဘၣ်ကီဘၣ်ခဲသ့ၣ်တဖၣ်အအိၣ်န့ၣ်လီၤ. ကညီကရၢမံၣ်နံၣ်စိထၣ်တူၢ်လိာ်ပှၤမၤတၢ်ဖိတနံၣ်ခံဂၤလၢအဟဲခီဖျိလၢ Minnesota opportunity Corps (MOC) ဒ်သိးကမၤစၢၤ တၢ်ဖံးတၢ်မၤ အပှၤဟ့ၣ်ကူၣ်တၢ်တဖၣ် (employment counselors) ဘၣ်ဃးတၢ်ဃုတၢ်ဖံးတၢ်မၤလၢ ပှၤဘၣ်ကီဘၣ်ခဲသ့ၣ်တဖၣ်အဂီၢ်န့ၣ်လီၤ. ပှၤဘၣ်ကီဘၣ်ခဲတၢ်ဃုဖံးဃုမၤတၢ်မၤစၢၤတၢ်ရဲၣ်တၢ်ကျဲၤ (RES) မၤစၢၤပှၤဘၣ်ကီဘၣ်ခဲလၢအဟဲတုၤလၢ ကီၢ်အမဲရကၤအပူၤစှၤန့ၢ်ယဲၢ်နံၣ်သ့ၣ်တဖၣ် ဒ်သိးကဃုန့ၢ်တၢ်ဖံးတၢ်မၤလၢအဂၢၢ်အကျၢၤအဂီၢ်န့ၣ်လီၤ. ကညီကရၢမံၣ်နံၣ်စိထၣ်ဟ့ၣ်နီၤလီၤစ့ၢ်ကီး ESL တီၤပူၤတၢ်သိၣ်လိဟဲခီဖျိ ကၠိသရၣ်/မုၣ် လၢ Roseville Adult Learning Center အအိၣ်န့ၣ်လီၤ. ကညီကရၢမံၣ်နံၣ်စိထၣ်တၢ်ဃုဖံးဃုမၤပှၤဟ့ၣ်ကူၣ်တၢ် (employment counselors) ဟ့ၣ်လီၤစ့ၢ်ကိးတၢ်မၤလိဘၣ်ဃး တၢ်ကွၢ်ဃုတၢ်ဖံးတၢ်မၤ (Job Club) ဖဲမုၢ်ဖီဖးဂီၤခီ (၉) နၣ်ရံၣ် တုၤဟါခီ (၂) နၣ်ရံၣ် ကိးနွံဒဲးန့ၣ်လီၤ. တၢ်ဆီၣ်ထွဲမၤစၢၤအကတၢၢ်တမံၤလၢ ကညီကရၢမံၣ်နံၣ်စိထၣ် ဟ့ၣ်နီၤလီၤမ့ၢ်ဝဲ ခီၣ်ခါဆူညါတပတီၢ်ဒီး သးသမူဒီစိၤတၢ်မၤအကျဲတၢ်ရဲၣ်တၢ်ကျဲၤ (Next Step and Career Pathways programs) ဆူပှၤဘၣ်ကီဘၣ်ခဲလၢအဟဲအိၣ်လၢ ကီၢ်အမဲရကၤအပူၤယံာ်တ့ၢ်လံဒီးပှၤသ့ၣ်တဖၣ်လၢအသးအိၣ်ထီၣ် တၢ်လုၢ်အီၣ်သးသမူတၢ်မၤလိ မ့တမ့ၢ် ဃုတၢ်ဖံးတၢ်မၤလီၢ်လၢလိၣ်ဘၣ်တၢ်သ့တၢ်ဘၣ်လၢပတီၢ်ထီတဖၣ် အဂီၢ်စ့ၢ်ကီးန့ၣ်လီၤ. တၢ်ရဲၣ်တၢ်ကျဲၤအံၤအဂီၢ် ကျိၣ်စ့တၢ်မၤစၢၤဟဲခီဖျိလၢ တၢ်ဖံးတၢ်မၤဒီးတၢ်မၤဂုၢ်ထီၣ်ပသီထီၣ် မုၢ်ကျိၤဝဲၤကွာ် အဝဲၤကျိၤ (Department of Employment and Economic Development [DEED]) အအိၣ်န့ၣ်လီၤ. KOM provides support services to refugees who are looking for work and those who are employed. KOM’s employment counselors facilitate job placement and vocational training for refugees. KOM also hosts two Minnesota Opportunity Corps (MOC) members each year who assist employment counselors with finding jobs for refugees. The Refugee Employment Services (RES) program helps refugees who have lived in the U.S. less than 5 years find stable employment. KOM offers daily ESL classes with teachers from Roseville Adult Learning Center. KOM employment counselors also lead a Job Club on Fridays from 9:30am-2:00pm. 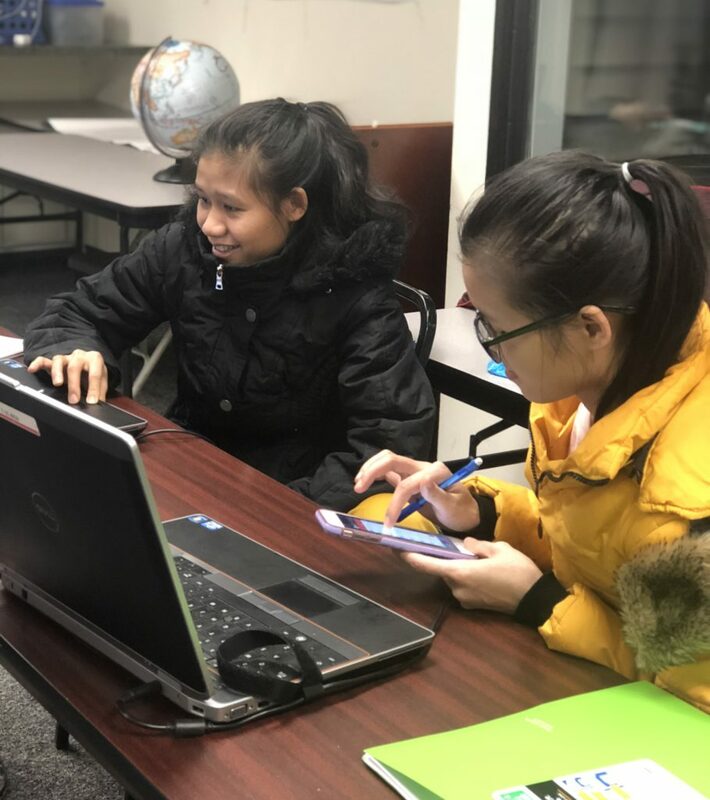 Lastly, KOM offers Next Step and Career Pathways programs for refugees who have lived in the U.S. longer and are looking for vocational training or jobs that require higher skill levels. To learn more about employment services, contact Morrison Johnny, Employment Program Manager.